Audi will be hosting the world premiere of its first all-electric SUV, the e-tron, on 17 September 2018 in San Francisco. The production of the vehicle has already begun in the company’s CO2-neutral Brussel production facility and its deliveries are expected to begin in some markets by early 2019. In the buildup to the e-tron’s launch, Audi has also released a teaser. With the cover slightly raised from the front left, you can see the sleek headlamps and bumper finished in Catalunya Red paint. 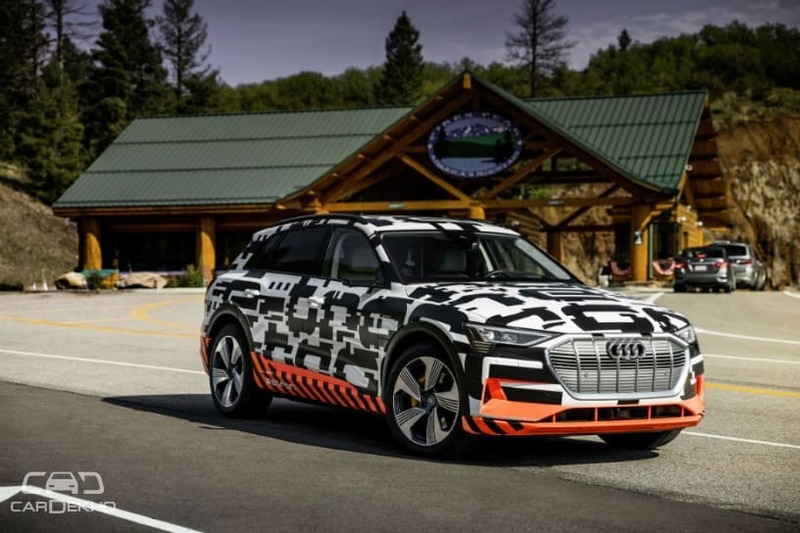 Until now, we have only seen the camouflaged versions of the e-tron. The full size electric SUV has a motor on each axle which develops nearly 408PS of power and 561Nm of torque. It can reach 100kmph from a standstill in less than 6 seconds on its way to an electronically limited top speed of 200kmph. Audi says it can cover more than 400km (WLTP) in a single charge. To put things into perspective, its closest rival, the Tesla Model X P100D has a range of 475km with a 0-100kmph time of 2.9 seconds. Its other rivals include the recently introduced Mercedes EQC and the Jaguar I-Pace. Also Read: India-Bound Audi e-tron Electric SUV’s Futuristic Interior Will Blow Your Mind! However, there’s a slick trick up its sleeve. The e-tron recuperates energy with an “electro-hydraulically” integrated braking system which increases the travel range by one km for every km travelled downhill. It is claimed to be capable of regaining more than 70 per cent of its power and torque production output which equates to 220kW and 300Nm, respectively. Audi claims this is the highest ever efficiency achieved by any electric car in production. How well the production version fares though is anyone’s guess for now. Audi’s India head, Rahil Ansari had said in the SIAM convention,” “It was pleasant to receive positive signals from the Government on Electric vehicles and about their support to the automobile industry. With Audi’s global focus towards electric mobility, our project ‘Electrified India’ is already underway and we are in a position to launch the ‘Audi e-tron’ as soon as 2019-2020, subject to conducive market conditions.